Malignaggi was a part of Conor McGregor’s early training camp for his boxing match with Floyd Mayweather Jr. 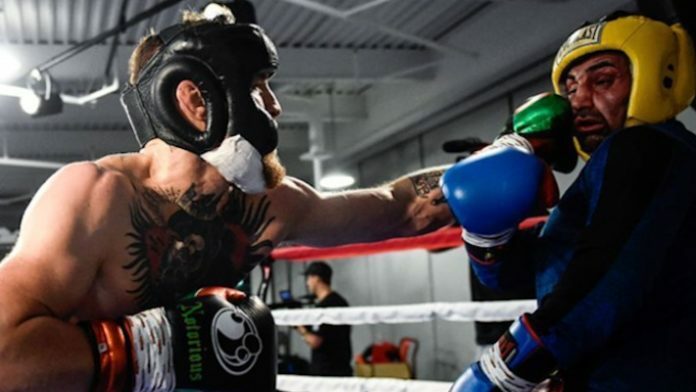 However, the McGregor camp leaked out some footage from he and Malignaggi’s sparring session. The clip showed McGregor knocking Malignaggi down to the canvas. However, Malignaggi claims that a bad camera angle made it look like the Irishman knocked him down, when he truly tripped. “I assure you he will never fight me,” Malignaggi said. “No balls wasn’t a catchphrase, it is a fact. I’m sure the footage will be cut around to show what they want to show you. He doesn’t have much, though. Having said that, even with the not much they have, they’ve convinced basically everyone of this bulls**t narrative. “It’s actually good fun to watch. I assure everyone it is, but he’s trying to perpetuate a lie. Me not being in shape or sharp aside, it was good action. And he has to thank his lucky stars that’s the shape I was in. “Because despite 16oz gloves and headgear, that’s the only reason he doesn’t get stopped even in sparring. I had to deaden the pace for the sake of making sure I can finish the twelve rounds. “It is the only reason he doesn’t get assaulted by me in that session. He has to, though, as we did eight rounds the first time. That one I still hadn’t got the memo that we had a beef and I took the casual approach to figuring out that he needs work. The second one, we both were meaner spirited though. Do you think Malignaggi and McGregor should box each other?